January 2nd, 2019 (4:09 PM). Edited 3 Weeks Ago by Avara. NOTE: If you are using binary hacking tools and methods, this tutorial is not relevant to you. This is for those who are using the pokéemerald decomp. If you're using XSE, this tutorial is where you want to look! If you already know XSE scripting from binary hacking, you should be able to pick up scripting in the decomps without too much trouble. However, if you're totally new to ROM hacking and want to begin with Pokéemerald, this guide will hopefully be of some use to you! If you're struggling with a script even after reading about a topic, feel free to leave a comment, PM me here or on Discord @Artemisia and I will be happy to try and help you out! What are the differences between scripting in binary hacking vs scripting in pokéemerald? There are several advantages I'm keen to share with you! First of all, you don't need any special scripting tools such as XSE - all you need is a text editor such as Notepad++. Second, it's easy to modify existing scripts - you simply edit the “scripts.inc” file as needed and hit "Save". Binary would require you to repoint your script, which brings me to my next advantage. There's no need to think about free space and offsets because the building process takes care of everything for you. Worries about free space or accidentally overwriting something are a thing of the past! This thread is a work in progress and might look a little dishevelled or incomplete as of right now, but I'm committed to finishing it quickly. 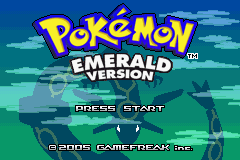 At the time of writing this, Pokéemerald is around 80% decompiled, so file locations and labels might change in the future - I'll do my best to make sure this is updated accordingly as development goes on. To set up Pokéemerald read this. After you've got everything set up, all you need is a decent text editor like Notepad++ and PoryMap to get started!